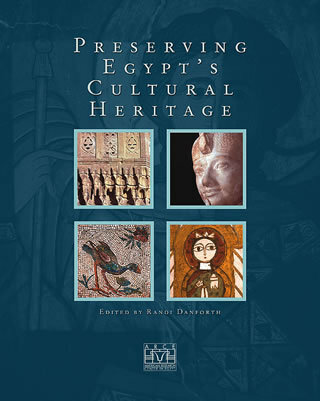 Under the directorship of the late Robert K. Vincent, Jr., conservation projects funded by USAID in collaboration with Egypt’s Supreme Council of Antiquities ranged widely in their scope. Information about early animal domestication was compiled from prehistoric sites in the Sinai; the shattered sarcophagus of Ramesses VI was reassembled in his tomb; exquisite Greco-Roman mosaics were conserved in Alexandria, and fine Coptic wall paintings were cleaned. The wooden door leaves of Bab Zuwayla were saved from decay, and numerous training programs were conducted, including archaeological field schools for Egyptian antiquities inspectors. Contributors: Hoda Abdel Hamid, Matthew Adams, Jere Bacharach, Elizabeth Bolman, Edwin. C. Brock, Betsy Bryan, Anthony Crosby, Randi Danforth, Agnieszka Dobrowolska, Jaroslaw Dobrowolski, Mark Easton, Renee Friedman, Alaa el-Habashi, Douglas Haldane, Nairy Hampikian, W. Raymond Johnson, Michael Jones, Charles Le Quesne, Carol Meyer, Anthony Mills, David O’Connor, Bernard O’Kane, Diana Craig Patch, Lyla Pinch-Brock, William Remsen, Salah Zaki Said, Shari Saunders, Gerry Scott III, Peter Sheehan, Hourig Sourouzian, Robert K. Vincent, Jr., Nicholas Warner, Fred Wendorf, Willeke Wendrich, and A.J. Zielinski.